Flung just slightly further than the classic short-break cities of Europe, Budapest owes its allure to a combination of things; in the Hungarian capital there’s a sense of Western European familiarity tinged with an exciting air of ‘other place’. Even the name – created when the towns of Buda and Pest merged – feels faintly exotic. Oh and the flight from London takes less than three hours. Here’s how to explore Budapest as a first-time visitor. Budapest is known for its historic thermal bathhouses, and the Széchenyi Baths are the most famous of them all. 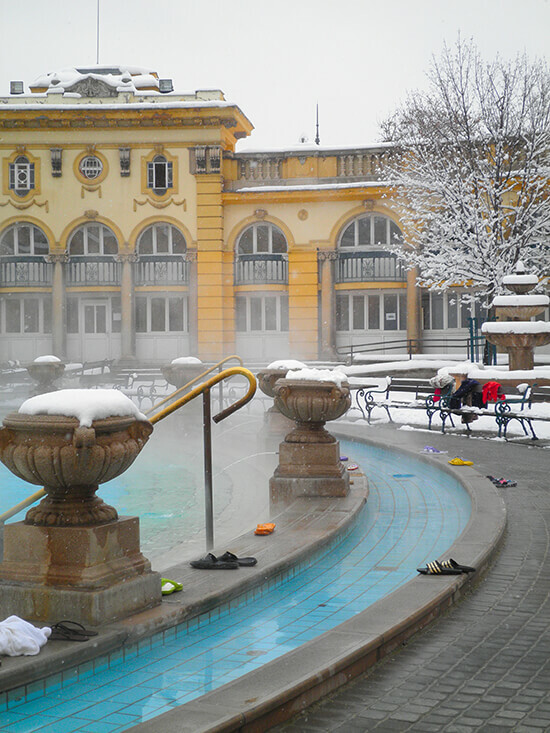 Supplied by not one, but two thermal hot springs, Széchenyi is the largest medicinal bath complex in Europe. Indoors, an almost endless array of steam rooms, saunas and plunge pools are on hand for the serious bathhouse-goers, while a big swimming pool and whirlpool corridor await in the open air. Massage jets soothe aching muscles and the geothermal heated water is full of healing minerals to cleanse the skin, naturally. Nowhere does retro drinking like Budapest and the city’s iconic ruin pubs are the place to spend an evening. In the center of town, a whole host of empty courtyards and buildings that once were factories or flats have found a new lease of life. Vintage furniture was repurposed and bars serving alcohol installed; ruin pubs were born, and every single one bursting with unique character and the kind of mismatched furnishings that any hipster would die for. 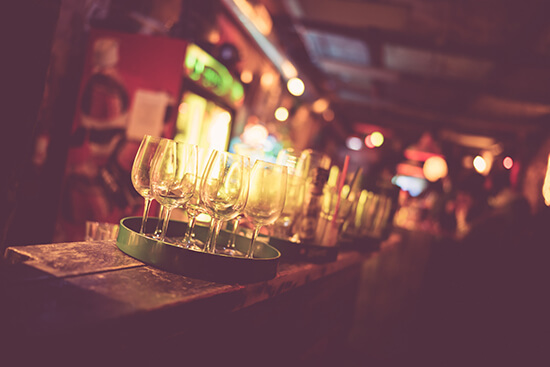 Head down Kazinczy Street to find Szimpla Kert – one of the original ruin pubs. Spread over several floors, trees grow in the central courtyard and there’s live music or a DJ every night. Once you’ve walked up to the top of Castle Hill (or caught the funicular), it’s easy to see why Hungarian royalty chose this spot for their immense palatial residence. Overlooking the Danube from high up on the Buda bank, the view of the river wriggling through the town below is Budapest’s most picturesque. The UNESCO-listed Castle Hill area consists of an Old Town and a wealthy district, home to Budapest’s most important historical monuments and the massive 18th century Royal Palace complex (or, Buda Castle). Up here you’ll also find the Hungarian National Gallery, the Széchényi National Library and Matthias Church. One of the prettiest places on Castle Hill is also one of the most underrated: Halászbástya, also known as Fisherman’s Bastion. Decorative, swirling turrets with spiral staircases perch on the edge of a terrace behind Matthias Church. Unlike many of the colourful surrounding buildings, not a lick of paint is to be seen – the elegant, weathered white stones simply stand and age with grace. It’s also where you’ll find the best views over the Budapest. …other than Castle Hill, that is. Another of the classic to-do’s in Budapest is to cross the Danube on your own steam. Not by swimming or rowing, mind, but by walking across the impressive iron Chain Bridge that connects the Buda and Pest banks and features on many postcards. The hundreds of neo-Gothic spires and Renaissance Revival dome of the Hungarian Parliament Building on the Pest (east) bank, are best spied at night, lit up spectacularly and reflected shimmering in the river. 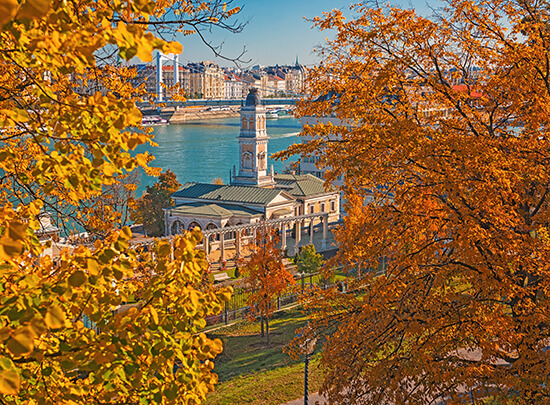 Cupola-topped St Stephen’s Basilica and colunnaded Heroes’ Square, lined with bronze statues depicting the Seven Chieftains of the Magyars, are also on the must-see list. Within Buda Castle, Budapest History Museum is a whistle-stop tour of how the Hungarian capital city came to be. There’s plenty to capture curious minds, with artefacts from Roman, prehistoric and medieval times, as well as information on the building and reconstruction of the Royal Palace. Also up Castle Hill, the Hungarian National Gallery all but overflows with Renaissance and Baroque art while, across the river, dinosaurs and whales await visitors to the Natural History Museum. 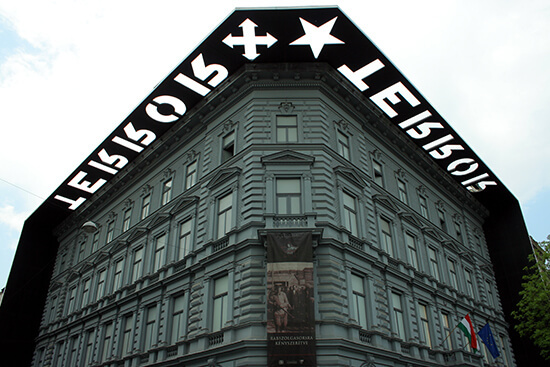 For something a little different, the Terror Museum occupies the former headquarters of the communist secret police and offers an intriguing (if slightly morbid) exhibition on some of the more severe periods of the country’s modern history. 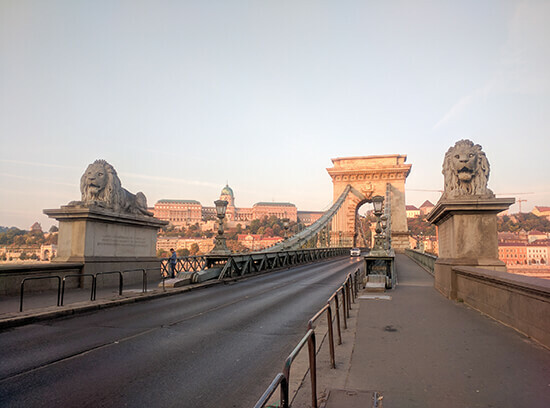 Budapest is one of those neat cities that manage to pack a weighty punch of culture and architecture and must-see sights, but don’t require much effort to travel between them. How handy. If you’re fit and healthy just pick up a map; a lot of the main attractions are within walking distance if you’re staying somewhere central. However if you’re keen to cram lots into an action-packed day or want to explore the further reaches of the city, the tram and the metro systems are easy to use and service the whole city. This is the best part: there’s not really a bad time to visit Budapest! In the summer months, the climate is warm and the sun shines daily, and in the mild winter months, the temperature rarely drops below freezing and the festive Christmas markets discard any hint of cold. To avoid most of the crowds and take advantage of the pleasant weather, visit between March and May, or September and November. Get inspired for your trip to Budapest by our NEW Europe City Breaks brochure, or make an appointment with one of our Travel Experts to book your trip today.